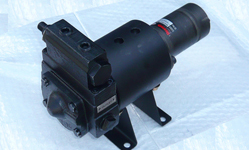 MODEL HDC – OVERHUNG LOAD ADAPTOR FOR HYDRAULIC MOTORS. Reduces premature motor or pump failure due to overhung loads (axial and radial) on your motor or pump shaft. Prevents contamination of hydraulic fluid. Provides a solid, permanent mounting surface. Permits the removal of hydraulic motors for servicing. Seals out dirt and grime. Our HDC overhung load adaptor for hydrualic motors have removable SAE hydraulic motor adaptors and may be supplied with SAE “A”, SAE “B” or SAE “C” motor interfacing. With 10 standard shaft size options we can accommodate almost any SAE Hyd motor up to SAE “C”. The HDC overhung load adaptor can be either foot or face mounted via a set of front mount holes and pilot. 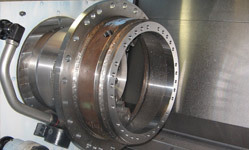 Bearings can be either Taper Roller or Cylindrical Roller types depending on the application. For applications with high axial load such as fan drives or mixer units, then Taper Roller bearings are recommended. For applications with little or no axial load such as chain or pulley drives, then Cylindrical Roller bearings can be used. The advantage of Cylindrical Roller bearings is that servicing and replacement is easier as no preloading of the new bearings is required, making field servicing of the unit easier and more economical. External dimensions for both bearing overhung load adaptor types are the same. Units are usually supplied factory oil filled. 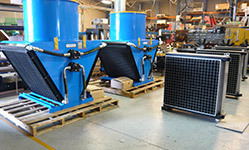 Grease filling is required for vertical mount applications. OEM’s experienced Engineering team can design a custom overhung load adaptor to suit you application. We have provided manufactured many variations including longer shafts, shorter shafts and custom mounts. For more information download the page from our catalogue.